Galiano Island | Turning my world upside down! This island was probably my favourite of the 3 we visited so far. It’s far less populated and has a really relaxed vibe. We arrived late in the afternoon and camped at Montague Harbour Marine Provincial Park which is one a lovely marina. The camp host recommended we take the bus to the Hummingbird Pub for the experience. We’d heard something about this but no one tells you much so as not to spoil the surprise. So we walked up to the bus stop just outside the park and up comes a yellow school bus full of people our age, hooting and­­ singing along to the music. 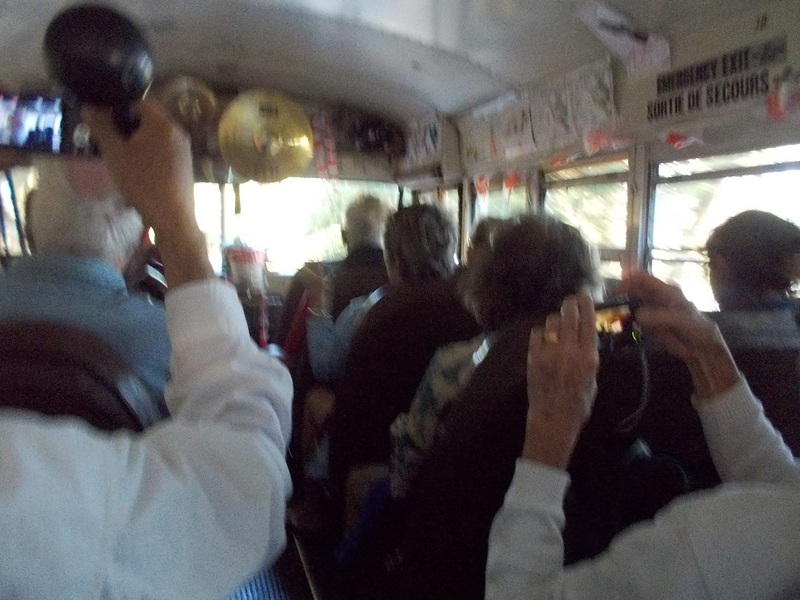 Tommy Transit, our driver, handed out various percussion instruments (I got the tambourine) and we drove towards the café singing along to the Beatles’ Yellow Submarine. In no time, we pulled up to the pub and enjoyed a nice meal (I ate a halibut burger) with a glass or two of wine. The wait staff had a short time to chat with us and we found out they were originally for Ontario. It seems there are a lot of people from Ontario who move here. Tommy Transit passed his guest book around for us to sign up for his newsletter. He travels a lot in his off-time and his partner blogs about it. Of course, I shared my blog address too. We arrived back at the campground just in time for a few photos of the marina as we walked back to the campground. The next morning, we biked to the beachfront and took a circle route walk to see both sides of this bay and marina. The herons were out fishing and the clams were squirting water several feet into the air. At one point I heard an odd sound that turned out to be a large seal sitting near rocks, so still, that we could hardly tell the difference between him and the shore rocks. We decided to tour the island and stopped at two excellent vistas – Bellhouse Park which overlooks the Active Passage (hoping to see orcas) and Lover’s Leap viewpoint with its gorgeous view. I took a lot of pictures! We got on the ferry to Sidney and just couldn’t get enough of the views. By now I guess you have figured out that I love ferry rides. I just can’t think of a better way to see the ocean sights.